Trade and wholesale supply of thread. Please go HERE for some other thread options. Standard m120 spun polyester industrial sewing thread. Put-up on 1000Y/914M cops(minimum order just 5 cops per shade).100+ shades available! Standard m75 spun polyester industrial sewing thread. 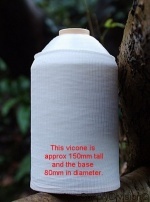 Normally used for slightly heavier sewing jobs such as workwear etc. Put-up on 5000y/4572m cones(minimum order just 2 cones per shade)Available shades are marked with an asterisk (*) on the shade card. No other shades are avaiable in this item.